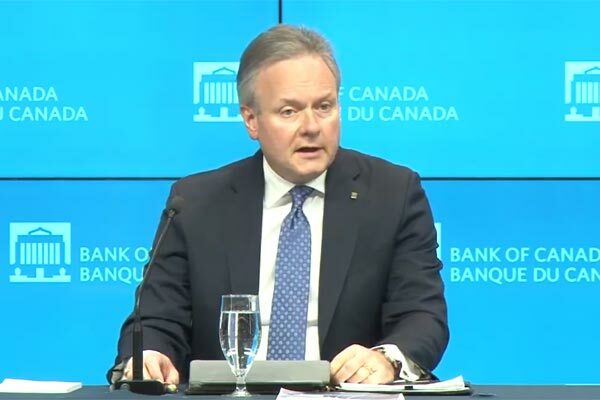 Bank of Canada governor Stephen Poloz says the economy needs a longer lift from stimulative interest rates to overcome domestic and global economic hurdles, though he predicts the country's recent economic weakness will only be temporary. Poloz, speaking Monday to a business audience in Iqaluit, Nunavut, noted the difficulties related to the late-2018 drop in oil prices, the cooler housing market and ongoing global trade uncertainty. He then argued the data have also shown "many areas of encouraging economic growth." "Clearly, there are challenges in the Canadian and global economies that we need to manage," Poloz said in his speech to the Baffin Regional Chamber of Commerce. "But there are clear signs that Canada is adjusting to the challenges." With increasing concerns about global trade wars and heightened caution from other central banks, markets will scrutinize Poloz's remarks for clues about the path of the bank's key interest rate. The central bank left its interest rate unchanged last month, saying there was more uncertainty about the timing of future hikes because Canada had entered a soft patch. Unlike the bank's accompanying statement for that announcement, Poloz's address Monday made no reference to future rate hikes. Canada's surprising economic deceleration in the final three months of 2018 and worries about the international outlook have fed market predictions Poloz's next move could, in fact, be a rate cut. Poloz remained cautious Monday, noting the "mixed picture" from the data will need to be carefully monitored. Late last month, recession concerns rose after the yield for Canada's 10-year bonds fell below the rate on bonds maturing in three months. It was Canada's first yield-curve inversion since 2007 — at the start of the financial crisis — and investors see it as a sign a recession could be on the way. "We're not forecasting a recession," Poloz told a news conference after his speech when asked about the inverted yield curve. "I respect that historically the inversion of the yield curve has happened at key points — it's not that it causes something, but it seems to be coincident." He stressed that there are different factors related to the recent, slight inversion compared to what's happened in the past. For example, Poloz said interest rates are much lower today, the stock market is performing well and investors haven't pulled away from corporate debt. "For all those reasons, I think we are looking at an innocent inversion that's more statistical than indicative of a recession," said Poloz, adding that these inversions may happen more often in the future. The decision to leave the rate unchanged last month marked the third-straight policy meeting that it stayed at 1.75 per cent. Before the quieter stretch, Poloz had responded to Canada's stronger economic performance with five rate hikes between mid-2017 and last fall. Following last month's policy decision, the bank said interest rates will still need to rise over time to return to their neutral range. Asked Monday whether he expected rates to rise to the neutral level, Poloz said the range isn't a target for the bank, just a guideline. "How we get there, or when we ever get there, depends on too many things for us to predict."